Hostkey Review 2019: Is Hostkey a Good Hosting? Founded in 2007, HOSTKEY is a world-class telecommunications company that offers dedicated servers, colocation services, and cloud solutions to customers in Europe and Russia. The firm has data centers in the U.S., Russia, and the Netherlands. 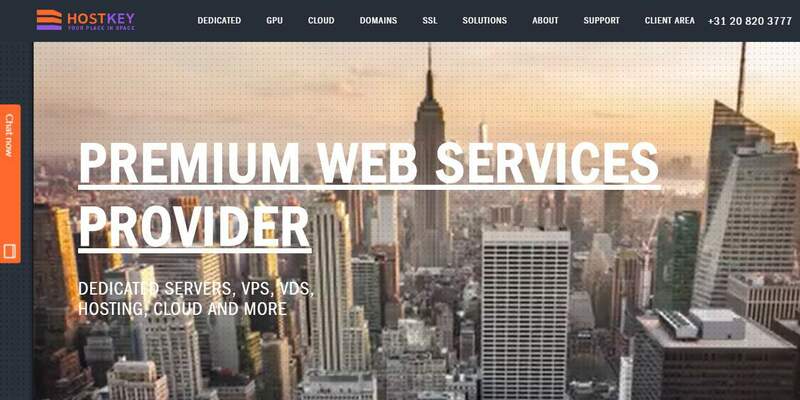 Founded in 2007, HOSTKEY is a reputable telecommunications company that offers dedicated servers, colocation services, and cloud solutions to customers in Europe and Russia. The firm has data centers in the U.S., Russia, and the Netherlands. Some of their key IT partners include Microsoft, cPanel, Huawei, NGINX, and DataPro. HOSTKEY operates Tier III data centers with 42 units per rack in New York, Moscow, and Meppel — which means you get a single point of entry to three massive markets. Every server is personally assembled and checked by their team of professionals. With their fully-redundant systems, you enjoy customized racks and full remote access on top of their 24/7 support. HOSTKEY shines in providing fully-customized hosting solutions that meet all advanced server needs. No matter how complicated a project is, they’ll deliver it in a timely and professional manner. With HOSTKEY, you can use private software or lease licensed software from cPanel, NGINX, or Microsoft. Once chosen, they’ll install and deploy the software on your dedicated servers in a matter of minutes. For complex projects, you can lease networking equipment at reasonable prices. Their network engineers will help you with the configuration and maintenance of these servers. If you need additional IPV4 addresses, you can get them individually or in packages of 32 all the way up to 512 across the United States, Netherlands, and Russia. The company also allocates IPV6 addresses across all their platforms free of charge. If you’d like to order these in blocks, you can talk to their support team. HOSTKEY has a sleek and user-friendly interface. From the client portal, you can order new services, adjust your account settings, access the knowledge base, or contact support. The company’s website is also fully responsive, meaning you can access your admin panel even on your smartphone. HOSTKEY’s plans are geared towards customers who are more concerned about performance and uptime than with prices, so they aren’t cheap to say the least. But looking at the features, their prices are justified. You won’t find a better deal than what HostKey offers their customers. If you want VPS solutions or dedicated servers, you can get them at discounted rates with the option to add more features. You can order custom servers, or buy pre-built ones with full root access. My only concern is that some of them use outdated hardware. Nonetheless, the 1-4 CPU cores are a great option for someone who wants more control over their servers. HOSTKEY provides around-the-clock IT support to customers. With 24/7 support, you’ll have little to worry about with server issues, and can instead focus on growing your business. Technicians and system administrators are always on standby to resolve server issues so that your website and apps are always available. In the event of an emergency, I’d advise you to call technical support to speed things up. Live chat and ticket support are also available for the majority of the day. You can use either channel to reach out to their billing and sales department, which is staffed by friendly and helpful personnel who listen more than they talk. They’re definitely not the kind of support that will force things down your throat or bombard you with upsells. Overall, my experience with the HOSTKEY support team has been a positive one. As an add-on, you can choose an SLA package that’s most convenient for you. You’ll find different types for ticketing support, server monitoring and reboots, replacement parts, backups, and even a dedicated personal engineer who’ll ensure that your server always performs optimally. If you want a terrific dedicated server management or cloud hosting service that comes with customizable server racks and the highest level of security, look no further than HOSTKEY. Wondering how Hostkey stacks up against other Web Hosting companies? Enter any other Web Hosting company and we will give you a side-by-side comparison.